Ventral view of coordinated respiratory movements of the opercula and pectoral fins of a zebrafish larva at 5 days post-fertilization. Adult zebrafish breathe by moving water in through the mouth, over the gills, and out through the open opercula (gill flaps). However, the gills aren’t fully functional until several weeks post-fertilization, so younger larvae depend on direct diffusion through the skin to meet their oxygen needs. To enhance diffusion, early respiratory behaviors combine cranial movements (which will persist into adulthood) with coordinated pectoral fin movements (which will drop out later in development). Side view of coordinated respiratory movements of the operculum and pectoral fin of a zebrafish larva at 3 days post-fertilization. Though the temporal properties change over time, larvae as young as 3 days post-fertilization exhibit rhythmic coordinated movements of cranial structures and pectoral fins. This suggests that the shared central respiratory networks driving these coordinated behaviors have already formed in the hindbrain, almost as soon as the cranial muscles are innervated by motor neurons — though these neural circuits are likely refined as development proceeds. Representative traces from facial motor neurons in a wild type zebrafish larva at 3 days post-fertilization. These two neurons represent two categories of facial motor neuron response: large bursts only, during attempted whole-body movements (top) and rhythmic bursts that coordinate with rhythmic movements of the operculum and pectoral fins (bottom). Spatial organization of facial motor neurons at 3 days post-fertilization.  Note that rhythmic neurons are located mostly in the ventral portion of the facial nucleus, while burst-only neurons are more common in the more dorsal portion of the facial nucleus. This early topography matches the pattern we see at 5 days post-fertilization. Furthermore, calcium imaging indicates that early facial motor neurons already exhibit some functional specialization, with neurons falling into two distinct groups according to their response patterns during respiratory behavior. These results suggest that not only are facial motor neurons receiving synaptic input from respiratory networks by 3 days post-fertilization, but that distinct sets of inputs are distributed topographically across the facial motor neurons as a population. Dendritic arbor of a facial motor neuron (magenta) labeled with GFP-tagged post-synaptic density protein (PSD-95, green). Note the green puncta, indicating potential functional post-synaptic sites. Future experiments will link the appearance and maturation of respiratory motor outputs to the appearance and reconfiguration of synaptic inputs to facial motor neurons, by imaging post-synaptic contacts in vivo across development.